Brian Conacher was not even close to a superstar hockey player or an innovating coach or manager. In fact, it was not until he began broadcasting that you could accuse him of being a household name amongst hockey fans. And that was quite some time ago now. Though he was a journeyman player from some time ago, he was a keen observer of the game of hockey like few others. And he lived a vagabond life of hockey that led to one of the most diverse and unique outlooks on both hockey and undoubtedly life. And Conacher shares many of his experiences and outlooks in his 2007 autobiography As the Puck Turns: A Personal Journey Through the World of Hockey . The book is published by Wiley. Conacher was born into hockey royalty. He is the son of Lionel "Big Train" Conacher, Canada's athlete of the half century in 1950. His uncle was none other than Charlie "Big Bomber" Conacher. Another uncle, Roy Conacher, and two cousins, Peter Conacher and Murray Henderson, also played in the National Hockey League. Conacher played at every level of hockey, including junior, university, international, Olympic, AHL, WHA and NHL. He is best associated with Father David Bauer's Canadian national team program where he parts of 5 seasons, including the 1964 Olympics. However many fans will remember him as a fringe player on the roster of the last Toronto Maple Leafs team that won the Stanley Cup in 1967. Interestingly, Conacher begins the narrative of his life after the ‘67 Cup win. I personally found that to be disappointing, because I really wanted to know more about his youth and upbringing in the famous Conacher family, as well as his time with Father Bauer's Nats. He does sparsely talk about these topics later on. He barely mentions his time with the Leafs though, downplaying his own NHL accomplishments unnecessarily. For a fringe player who was essentially out of the league after a couple of seasons, Conacher's journey sure offers lots of hockey history to observe. And the book really grabs the reader's attention that way immediately. He would rejoin the Canadian national team just in time for one of the most volatile periods of international hockey history. He would go on to a broadcasting career highlighted by his job as colorman for the legendary Foster Hewitt in the 1972 Summit Series. He would then make a come back, bouncing around mostly the minor leagues as well as the NHL and WHA. He would also become a manager in the minor leagues and with the WHA Edmonton Oilers. Conacher, who drew a lot of ire from the NHL over the years for his willingness to challenge conventional wisdom, keeps his beliefs in tact as he offers interesting observations on all of his tour stops. His love for the international game remains evident, even though he was rightfully jaded over the way the IIHF and especially it's leader Bunny Ahearn blatantly cheated the Canadians. He keeps his beliefs in check as he beautifully broadcasts the Summit Series. 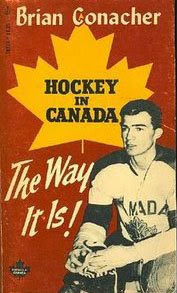 In the book though he openly laments hockey violence as shown by the Canadians, as well as Canadian ignorance of the international game, the Soviet players and Father Bauer's Nats. I knew I'd lap up anything Conacher had to say about international hockey in the 1960s and 1970s, as this is a passion of mine. But I was more than happy to read beyond these opening chapters, as Conacher joins a team and league most of us have never heard of - the Mohawk Valley Comets of the fledgling North American Hockey League. He offers a lengthy and rollicking recollection of the trials and tribulations running a team, introducing some interesting situations and characters. It's a great read. Of course Conacher was there first hand to also comment on pro hockey in the 1970s, including the creation of the World Hockey Association, NHL expansion and the resulting dilution of the player pool and the increasing violence and goon tactics. Conacher was even an extra for hockey's greatest movie, Slap Shot starring Paul Newman. Conacher offers some interesting insight on the inspiration for some of the scenes. Conacher's travels aren't done yet. He would become a rink manager in Edmonton, Hamilton and Toronto, where he comments on Gretzky's young Oilers, Hamilton's bid for a NHL franchise, and, in what may the most intriguing aspect of the book to many, the fabled Maple Leaf Gardens. Conacher's insight into the Maple Leaf organization allows him to comment on and criticize his former team's lack of success since 1967. Brian Conacher's book is an easy read, never getting too deep or critical. He had many unique vantage points, almost too many for a great book. But through his observations and insight he has written a better than average hockey autobiography. You will especially agree if you share an interest in international hockey, 1970s hockey or the Toronto Maple Leafs. 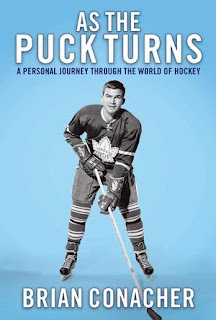 The one thing Conacher's book lacks, and it is a common failing of hockey autobiographies, is he never allows us to see him up close and personal outside of the realm of hockey. Maybe the book is long enough already at nearly 300 pages, but he is clearly a unique individual, never staying in the same place for too long and unafraid to try new challenges. His hockey career is unconventional as it is fascinating. I just wish we could learn more about the man that allowed himself to be so bold and brave, as well as hear some of the great stories of his life outside of his vocation. For a fringe player who most fans from the past couple of generations know next to nothing about, this book really impresses the reader early that Brian Conacher is a unique person with lots to offer, especially in the realm of hockey. The kind of person who we want to get to know. Did you know? This is Brian Conacher's second book. His first book was published 27 years earlier. He penned Hockey In Canada: The Way It Is. Conacher wanted to honor Father Bauer and the Canadians national team of the 1960s, rightfully feeling the underappreciated Nats were an important part of hockey history. The book actually angered the NHL because they did not like his criticisms of the pro game. This book helped to black list Conacher. Conacher says the NHL even tried to have him removed from broadcasting the 1972 Summit Series. Coached the MV (Clinton) Comets. In those days, each team was responsible for recruiting/ scheduling linesmen(can you imagine! ), and that's how I got into the pro ranks as an official, winding up in the AHL. I was too old, married with kids, and had a career to follow, so I never tried to go beyond the AHL. Do you know where Brian lives? I have lost touch with him.